Since late last week, the topic of online video has worked its way into a few headlines. First, it was announced that Facebook has launched Lasso: a short-form video app seemingly designed to compete with TikTok, which is a similar app allowing users to upload quick videos that are usually powered by a musical background. The same day Lasso’s launch was announced, Giphy — known as a database of short, animated GIF images — announced that it, too, would launch its own short-form video platform. But almost as soon as this new battle for the favored short-form video platform began to break out, new information emerged that other platforms are embracing long-form video — and by “long,” we mean upwards of 75 minutes, in some cases. So we wanted to know: When it comes to online video consumption, where do users really weigh in? How familiar are they with these short-form video platforms, how much time do they really spend watching online video? We post these questions — and others — to over 6,500 people across the U.S., UK, and Canada to see what we could learn about the what, where, and how of online video consumption. Here’s what we found. 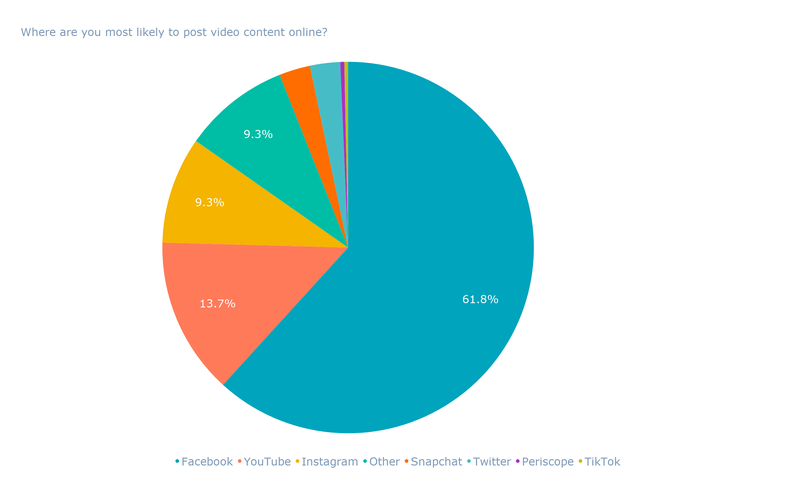 First, we wanted to measure awareness of these short-form video platforms, starting with TikTok. 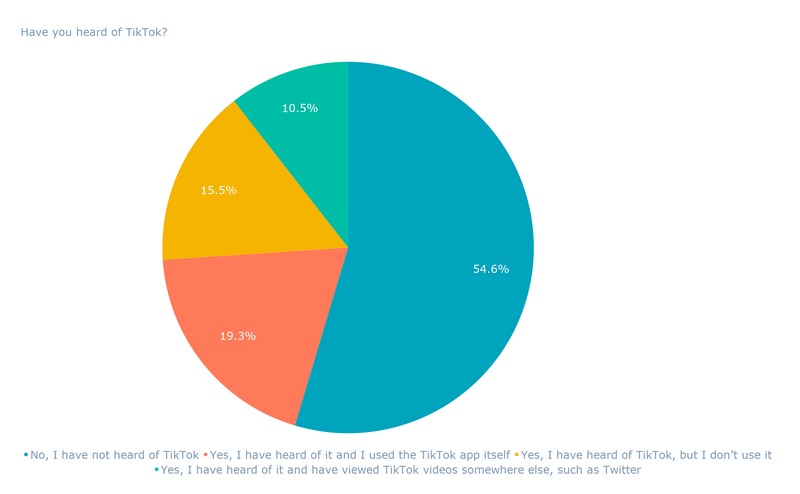 Over half of respondents — 54.6% — indicated that they are not familiar with TikTok. Then, we posed the same question about Giphy. Here, an even higher percentage of users — 61.3% — indicated that they’re unfamiliar with Giphy. It poses the question of how well Lasso — whose parent company, Facebook, made no major announcement of its launch and has no dedicated website — will fare in a market that’s becoming more crowded without much awareness. 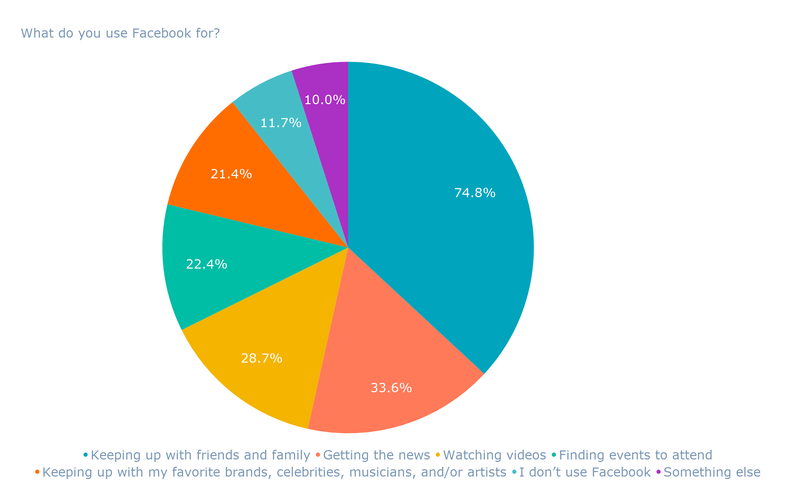 Next, we posed the question: What do you use Facebook for? Here, we found that less than a third of respondents — 28.7% — say that their primary use for Facebook is to watch videos. Instead, most people indicated that they mostly use Facebook for keeping up with friends and family — followed by those who said their primary purpose is getting the news. However, when we asked survey respondents — Not including streaming TV and movies, where do you watch online video? — over half of them said they do so on Facebook. However, Facebook didn’t quite beat out video hosting platform YouTube, where just over 70% of respondents say they watch online video. Instead, it took the lead in user posting preferences, with 61.8% of respondents indicating that they prefer to share video on Facebook over other platforms. 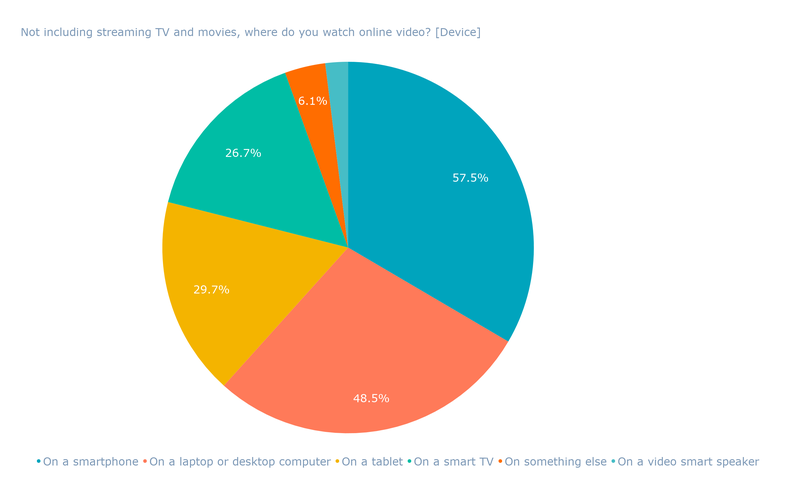 We also wanted to know which devices people were using to consume online video. Just over 87% of respondents said that they watch online video on a mobile device, with over half of them indicating they do so via a smartphone. The high rate of online video consumption via mobile could indicate potential growth for short-form video platforms like TikTok — even though 2.8% of respondents listed it as their primary app for watching (and .3% saying they prefer to share video there). Where these apps could possibly see a faster rate of growth is in integrations with apps that are a bit more native mobile users, such as with Messages app extensions on iOS devices. When we posed the question — Not including streaming TV and movies, what would you estimate is the longest online video length that could hold your attention? — the results were mixed. The lowest number of respondents — only 7% — said they could only maintain attention for a video that was less than five minutes long. In fact, the highest percentage indicated the opposite, with over 20% saying that they believe a video over 75 minutes long could hold their attention. That could explain the popularity of YouTube in earlier questions, where videos that are 20 minutes or longer appear to be gaining in favorability among creators and viewers alike. At the same time, people seem to downplay the amount of time they spent watching online video each day. 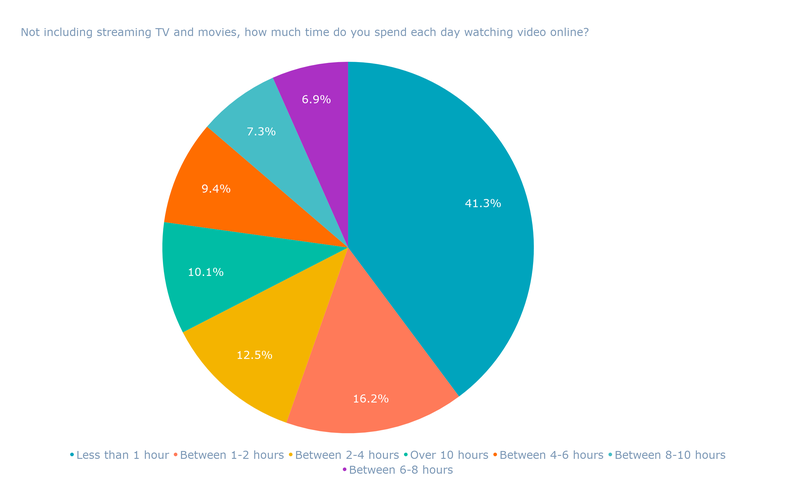 Although a decent amount claim that they could sit through a feature-film-length video, most also say they spend less than an hour watching online video each day. For now, it seems that the trajectory of short-term video is ambiguous at best. Snapchat, for instance — which some call a pioneer in the area of short, ephemeral videos — has actually shown to be shrinking, not growing. That could explain why platforms like Facebook and Instagram are launching platforms dedicated to longer-form videos (Watch and IGTV, respectively) — because, it seems, our preferences could be leaning toward video content that is more enriched and in-depth. This potential growing preference should be observed by marketers and those creating video on behalf of their businesses. While it may not be wise to entirely invest in 75-minute videos, it could be worthwhile to ask: What kind of story would my audience like to see and hear with this amount of time? Want more data? Reach out on Twitter to let us know what news and trends you’d like us to ask questions about.